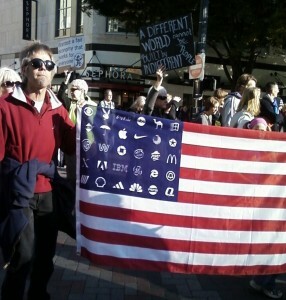 Well, I’m not sure about the representativeness of the signs carried at camp-outs and marches during Occupy Seattle. 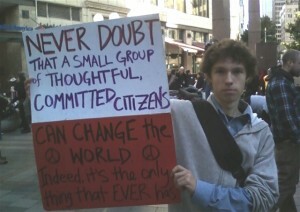 And to what extent can placards speak for a movement? In any case, here is my report on well over 100 signs that I transcribed for the record. Hopefully the reader will at least get an idea of what is on Occupiers’ minds. 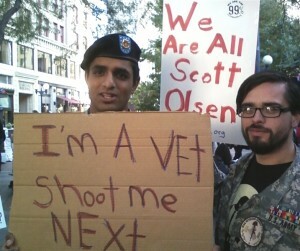 At Occupy Seattle this last weekend, a number of signs reflected indignation and outrage at the violence by police against Occupy Oakland, including serious injuries inflicted on a decorated veteran of the Iraq War, Scott Olson. If corporations are people, why aren’t they in jail? I will believe corporations are people when they give a sh-t. Corporations are not people; and money is not speech. A person has a conscience; a corporation has a bottom line. You started this expect us till its finished. It can be done — Kurt Vonnigut. 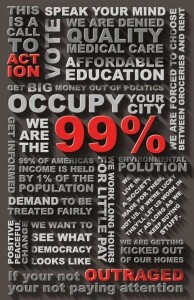 You are the 99% — Wake up. Organizations are not we the people. The Military-Industrial complex = Public Enemy #1. Have you noticed the global uprising? Where is Thomas Paine when you need him? 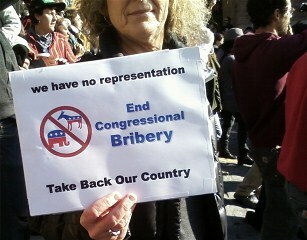 Get big money out of law-making. I’m here because I can’t afford a politician. I brought tea bags, now will you take us seriously? What Would John Maynard Keynes Do? Tax Wall Street; heal America. Its not a free market its a fixed market. People substituted for Bank, in Bank of America door sign. United We Bargain Divided we Beg. When the Poor are Less Poor, Everyone Gets Richer. We want jobs — tired of eating cake. No jobs hurts more than no agenda. Speak up. Life isnt a zero-sum gain. Korporate Kapitalist Kulture — Dont buy it.